Create advanced particle effects with the TimelineFX Particle Editor and export your effects to sprite sheets, animation strips or in separate files as a sequence of images. 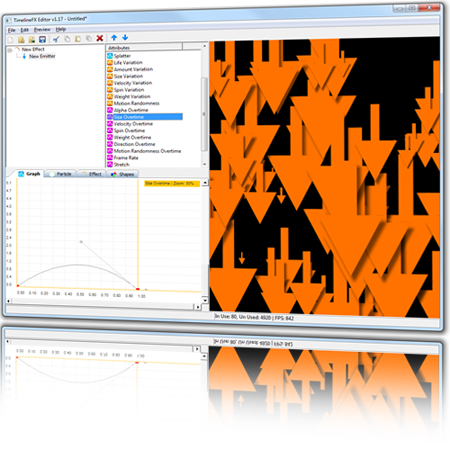 Create a full range of effects by drawing their behaviour on graphs and adjusting settings with the easy to use interface. To unlock the unregistered version you can purchase a copy by clicking here and a registration key will be sent to you via email. The trial version is fully featured with save disabled and only allows a maximum of 4 frames to be exported. Current version: 1.36 – 23.02.2019. For the latest changes see below. Mac version may notify you that it is not optimised, this is because TimelineFX on mac is still 32bit but this will be fixed in the next update. Windows 7 or greater/MacOS. Open GL capable GFX with at least 16MB. Pentium 3 or higher, 512MB system RAM. What’s new in TimelineFX Editor? * Example library is now stored in the executable to make Mac installations more friendly. * Full colour imports should now be correct on the Mac. * Fixed a crash when dragging an emitter onto its own parent effect. * Lock angle to motion setting now takes into account angle offset. * You can no longer create an effect with a shape you previously deleted from the library. * Fixed an issue with shapes lists not displaying correctly when there are a lot of shapes. * Fixed an issue when the example shapes are loaded at the start but the file doesn’t exist. * Added Super effects, these are effects that can easily contain other sub-effects without the need for a “container emitter”. find them under the edit menu. * A new example library loads when opening TimelineFX so new users can get straight into playing with effects. New option added under preview menu to diable this behaviour. * New splash screen for trial version to point people to verious onlie documentation and tutorials. * New effects/emitters/folders will be selected automatically when being created. * Added new history tab. Now each effect has it’s own history so that you can go back and revert changes. * Made sure that the register window is bigger for Windows 8 users. * Effects and emitter now remember which attribute was last selected. * Removed the double click to play effect in preview window and rplaced with single click. * Fixed a bug with specify columns on the export options which wasn’t starting with the correct values. * Note: This is a beta version, backup your effects! * Note: The toolbar has moved down the side of the application temporarily. * You can now preview the rendered effect whether or not it’s seamless. * You can now change the background colour of animations to anything you want. Select Chose Colour from the pop up menu. * The effect preview window for the animation dialog is now modal. If you want to make changes you have to close it first, not 100% ideal but atleast the export options are now remembered. * Added option to cap the FPS of the preview window to the monitor refresh rate. See the Preview Menu. * Any attributes that no longer have the default value will show an asterisk next to them to better indicate which ones are used. * Fixed a bug causing the window to reposition incorrectly when closing the program whilst minimised. * Fixed a bug with interpolated mode causing velocity not to register at all in some cases. * Replaced progress bars with busy dialogues as they seemed to be causing some problems on some PCs. There is still a progress bar when rendering though, so we will see how that goes. * Added new export option to save animations with 4×4 anti aliasing. * Animation zoom level now updates properly when tabbing away. * There is now a new menu option on the animation dialogue pop up menu – Extra Settings. This brings up an extra settings window with 2 check boxes: Resizing (using the -/+ buttons) automatically scales the effect as well, and option to make the auto-fit function force the effect to remain centred. * You can now preview seamless animations to check how well they tile. See the pop up menu to access it. * You can now double click on the random seed button to automatically get a new seed and update the animation. * The update button on the animation dialogue is now disabled until it needs to actually be used. * The zoom text box now has a spinner control to change the zoom level 1% at a time. * Changed how adding a border to the animation works when exporting. You can either add a 1 pixel transparent border, a 1 pixel border that copies the frame out to the edge (non-seamless), and a 1 pixel border that copies from the opposite side of the texture (Seamless). Needs testing some more though! * You can now specify the number of columns a sprite sheet has when exporting an animation. Default is automatic. * Fixed a bug causing a crash when cloning an effect whose name only contained numbers. * Fixed a bug causing duplicate effects to be created when dragging an effect with the same effect. * You can now increase the rate at which effects are updated. Change this using the preview menu and the updates per second option. 30fps will be enough for most effects, but some effects where you need to spawn a lot of particles that move in the same direction for example, a higher update rate can stop particles spawning on top of each other. Bear in mind that the higher the updates per second, the more performance required if there are a lot of particles. * Old effects files now have their shapes loaded in greyscale format by default. Greyscale shapes produce more accurate exports. * Particles that are black and lightblended are no longer drawn, but I still need a better solution for this! * Paint mode has been removed, it was just a bit of fluff and ended up causing more problems then it was worth! * Improved compatability on the range of mobile intel GMA cards/integrated – Thanks to vgreano and NielsJL for testing! * Exported animations now have the black background removed properly. * Clipboard is cleared when opening a new effect library, as pasting was causing errors. Use import library to bring in effects from other lirbraries. * PVR Support! You can now save to PVRTC Format (Mac only). * Copying graph data will now copy curves data properly as well. * File association for .eff files will now be set on windows installations. * Improved performance on Mac. To help performance even more there’s a new option on the preview menu: “Hide Status Text”. Hiding the status text seems to reduce stuttering of particles. * Fixed a bug where effects with sub-effects were not properly playing out the whole of their graphs. * Increased the max number of particles allowed to 10000. * Autofit now much much quicker! Also hopefully fixed a bug where it wasn’t autofitting properly after changing the width/height by hand. * Exporting animations should also be a bit faster. * Alpha and colour should now be recorded more accurately when exporting animations. * You can now set whether you want to import shapes as either full colour or greyscale. Set by going File menu -> Import Options. * New option on the particle tab: Group Particles. This will group particles by emitter which can be handy on some effects that have sub effects. It’s effct wide, so checking this option will apply it to the whole effect. * Fixed a crash bug when cloning an emitter and then trying to edit the active graph immediately after. * Imported effects should now correctly pick existing shapes in the library and remember them the next time the library is loaded. * Using the Global Zoom graph will now correctly work on emitters that use the splatter graph. * New Attribute! Splatter. This allows you to randomise where the particles spawn about their spawn point. It adds yet more possibilties with what you can do with effects. * Fixed a crash when importing animated particles if the settings you entered where too large for the image. * Fixed a memory leak that became evident after opening and closing a lot of effect libraries. * Fixed a problem with exporting 1 colour alpha, and grescale alpha animations that was introduced last update. * Busy Dialog now appears when importing shapes. * Fixed a bug where the random number generator for effects wasn’t working properly. * New Feature: Animation Controls Enhanced! The maximum size of an animation frame has been increased to 8192 x 8192. * Exporting an animation should now be quicker. * The editor now alerts you to any new updates when opening the editor. * Particles will now align properly when velocity is 0 on area, ellipse and line effect types. * Fixed a bug where some effects didn’t behave the same in the animation controls as they do in the editor preview. * New Feature: You can now Adjust the hue of the color bar for each emitter. Just right click on the colour bar and select Adjust Hue. * New Feature: You can now copy graph data to another graph, assuming they are of the same type. Right click the graph and select “Copy Graph Data” and use “Paste Graph Data” to paste the data to another graph. Note that the existing graph you copy to will be overwritten. * New Feature: You can now hide Graph Attributes that are not in use to make it easier to see which attributes were used to make an effect. * New Feature: When selecting an emitter by default it stops the other emitters in an effect from playing. You can now toggle whether you want to hide unselected emitters by right clicking and selecting “Hide Unselected Emitters” on the pop up menu. * New feature: There are now + and – buttons next to the width and height fields on the Animation Control dialogue. Pressing with double and half the size of the animation frame. * You can now clear all colors on the colour bar, just right click and select clear all. * It now asks to confirm if you want to open a new file if changes have been made. * Auto fit should be working a lot better, it had been a bit temporamental. * Fixed an issue stopping you from being able to save an animation with 1 frame. * Quick fixes for a couple of bugs that found their way in, background colour in preview window can be changed again, and animations should export properly again. * Fixed a bug causing animations to be drawn wrongly when using the frame slider in the animation properties dialogue. * The drop down menu on the export options dialogue now says “Sprite Sheet” instead of “Texture” to make things clearer. * New feature for exporting animations: Frame Step. This allows to only record every Nth frame to help reduce the size of animations. * Improved the seamless texture feature. Any sized particle will now seam ok.
* Copying an effect will now copy the animation properties as well. * You now get a little “please wait while animation saves” info box appear when animation is saving. * Autofix button was not being disabled when seamless option was checked when initially opening the dialog – now it is. * New Feature: You can now export seamless animations, so that they can be used as animated textures tiled seamlessly side by side. * New feature: Auto fit for animations. Clicking Auto fit will size the effect to fit into the frame size of the animation automatically. * New Graph Attribute: Global zoom. You can now scale the overal size of the effect using this effect attribute. * Fixed a bug causing playback of an effect in animation properties not to work properly after exporting the animation. * Fixed a crash when the animation dialog was closed and either the x, y, width or height fields lost focus. * Fixed a bug where locking the angle of a particle reversed the direction it was going in. * Added Global Stretch attribute. * The Graphs are no longer dependent on OpenGL to be drawn, this should increase compatability on older cards. * Fixed bug where resetting the stretch graph was not actually restting it. * You can now organise effects in the library more easily by creating folders, dragging and dropping, and changing the order that effects appear in the list. * Single particles now loop over thier overtime graphs. * When recording animations, low spec GFX cards will not display a progress bar which was causing animations to be rendered incorrectly.